Thursday January 24th 1884 I was busy about the work all the forenoon. Aunty Walker and Esther came just as we had dinner ready, we got a little time to talk with them in the afternoon. I sewed a little today. Friday January 25th 1884 I was busy about the work till noon. I went over to see about my teeth in the afternoon. Matt and John were here awhile. I sewed some in the evening. Saturday January 26th 1884 I helped some about the work this morning and sewed a little. Julia was able to come back to work today. I get my teeth tonight. Sunday January 27th 1884 I was at home all day as was most of the family for it snowed constantly. I spent the evening in the dentists room. 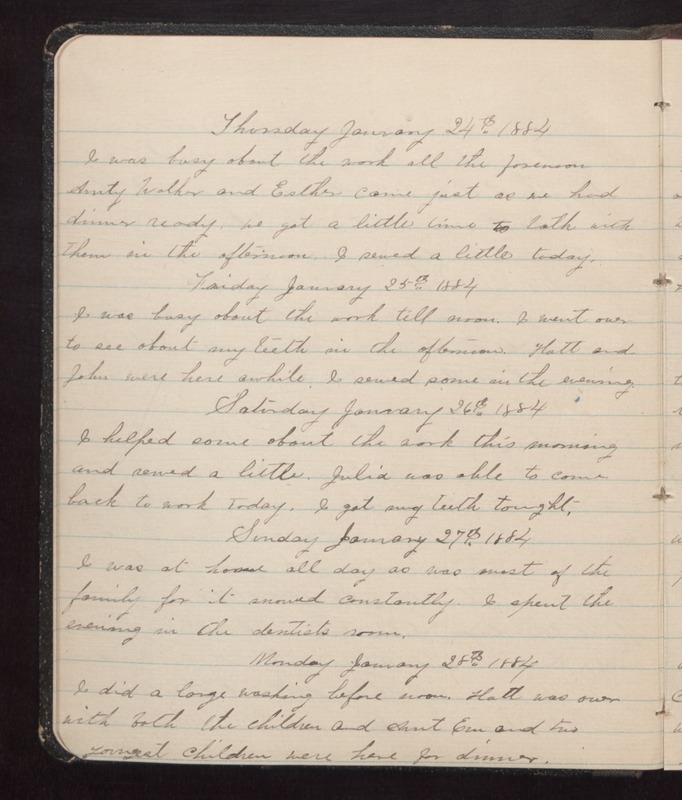 Monday January 28th 1884 I did a large washing before noon. Hatt was over with both the children and Aunt Em and the youngest children were here for dinner.